An authentic Canadian style Log Cabin - Tewksbury Lodge offers the unique experience of self catering accommodation in an authentic, hand crafted Canadian Style log cabin. 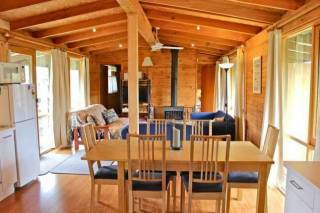 The lodge is very comfortably appointed with superior furnishings, log fire and spa. 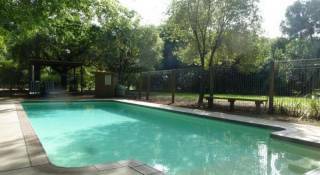 The kitchen is fully equipped, including dishwasher, and the laundry includes a clothes dryer for longer stays. The 2 bedrooms sleep up to 5 people. The main bedroom has a luxurious King Sized bed, the second bedroom has a Queen Sized double bed and a fold out single. 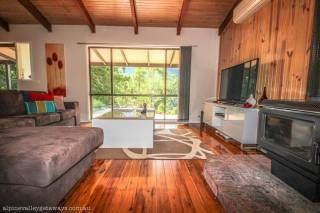 Situated on 2 acres of picturesque gardens with river frontage and views to Mt Buffalo. The Murray to Mountains Rail Trail for walking and cycling passes the front of the property. His & hers bicycles are provided free of charge. Firewood is provided free of charge during cooler months. Tewksbury Lodge provides an ideal retreat, uniquely different with the warmth and ambience only a true log home can provide. Recline in your leather lounge chairs inside, or sit back and relax outside in comfy chairs on the spacious verandah, with a private BBQ, overlooking secluded gardens. Finalist - 2011 & 2012 Victorian Tourism Awards. Children under 2 are free of charge if using own bedding. A deposit of 50% of the total booking amount is to be paid to secure a booking (specials or last minute bookings may require full payment at time of booking). We accept Visa, MasterCard and Bankcard. If you prefer payment by bank transfer, cheque, cash or money order, please telephone us or contact us via e-mail to make a booking. In the event that you cancel your booking, we are happy on most occasions to hold your deposit and stay at a later date. If you wish a refund of your deposit, then an administration charge of $50 or 5% of the full tariff (whichever is greater) will be deducted to cover our costs. However, if less than 30 days’ notice is given, the deposit is non-refundable unless we can re-let the lodge for the entire period of the cancellation with a booking of equal value.